England in 1190 was an unhappy land. Its people divided into two distinct classes: the Saxons, a slave race, and the Normans, masters who ruled without justice. More than a century before, the Saxons had been a free and happy people. But in 1066, they were beaten at Hastings by Duke William of Normandy - William the Conqueror. And to preserve their rule, the Normans built their castles and introduced brutal, repressive laws. The harshest were the Forest Laws. A man could be tortured and hanged for hunting for food to feed his starving family. Or made a wolfshead -- an outlaw whose head was worth no more than a wolf's. This is the story of one man -- Robert of Locksley, a Saxon farmer who was to become known as Robin Hood, the outlaw. A wolfshead. With that sonorous opening, so begins Wolfshead: The Legend of Robin Hood -- a little seen but influential Robin Hood movie. It was originally made as a television pilot -- funded, according to its director, by NASA rocket scientists and racetrack winnings -- and was bought by Hammer Productions, famed for their horror films and less famed for some earlier Robin Hood movies. After unsuccessfully trying to sell it as a TV series, Hammer released it to theatres in 1973 as a B-movie. It quickly vanished. 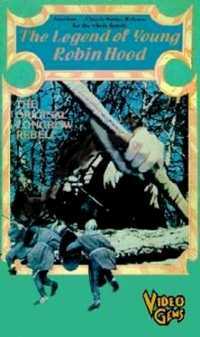 The opening narration comes from the rare 1981 Video Gems VHS release where it was retitled, presumably to appeal to a family audience, The Legend of Young Robin Hood. During the opening credits, Gyrth the Swineherd runs - possibly straight from his appearances in Sir Walter Scott's Ivanhoe -- across the stark mountainous landscape of North Wales .... errr, Yorkshire. It's a striking departure from the lush, sunlit forests of other Robin Hood films. Gyrth dashes into the village of Locksley, brushing past Robert and Much as he eludes the foresters pursuing him . Responding to the oafish chief Game Warden Legros's demands, Robert denies seeing a runaway serf. Legros attacks Robert, who uses a quarterstaff to defeat Legros and then the mounted Geoffrey of Doncaster. GEOFFREY: You'll hang for this. ROBERT: I'm a free man, and you're on my land. GEOFFREY: You attacked a knight and a royal game warden! ROBERT: Only to protect myself. That's the law. You have no power here. Take your men and get off my land. Geoffrey rides off, vowing "we'll meet again." Gyrth comes out of hiding and explains that he's a serf from the lands of Geoffrey's brother, Roger of Doncaster. Roger the Hangman as Much calls him. The foresters were chasing Gyrth because he had been hunting for food to feed his starving children - his young, mute son Tom and daughter Abbie. The newcomers are welcomed to the village by Robert's mother Katherine and his sister Alice. Meanwhile in the castle, Roger of Doncaster berates his brother Geoffrey for letting their sport get away. Geoffrey taunts Roger because they had been humiliated by "Robert the Yeoman". "Isn't he the one your lady Marian fancies?" Geoffrey asks. Roger rants about how Marian's love for Robert has delayed his plans to marry Fitzwalter's daughter. However, it would cause a Saxon uprising if they just murdered Robert. When Roger learns that Geoffrey came to Locksley in pursuit of a poacher, Roger asks if Robert had been hunting with Gyrth. Geoffrey doesn't think so, but Roger holds up a purse and says "I wonder if the game warden might remember." Then Roger appeals the Abbot of St. Mary's, noting that Robert's lands at "the edge of Barnsdale Forest" stand between the abbot's and the estates of Fitzwalter -- estates that will be Doncaster's if his much delayed marriage takes place. 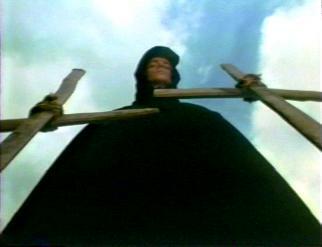 Roger pledges his support to the abbot saying he can go where the abbot cannot. Doncaster reckons with King Richard away on the Crusades, Prince John could use powerful allies in the north. The abbot says that if Robert "upholds the laws and pays his taxes, we cannot touch him". Roger summons Legros who enters holding a stag's antlers. Then the abbot agrees to outlaw Robert by using a blank warrant given to him by Prince John. Unaware of the plots against him, Robert meets his childhood sweetheart, the Norman lady Marian in secret and laments that they cannot be together. On the way back home, he runs into Friar Tuck, his mother's hermit priest. They encounter a frightened Tom and Abbie. 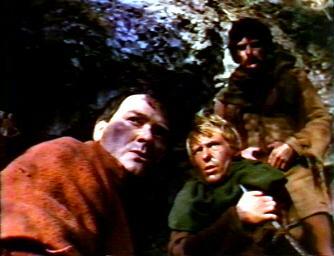 In a scene reminiscent of John Ford's The Searchers, Robert returns to find Locksley in ruins. Gyrth has been killed, and Robert discovers Alice's body -- with her dress torn open to reveal her bare legs, suggesting ... that perhaps Video Gems shouldn't have marketed this film as "an enjoyable experience for the whole family". Finally, Robert spots the notice proclaiming that he has been made a wolfshead. They think they're safe in their castles and armour. Since they've made me a wolfshead, I shall be one. None of them - Normans, priests, even their servants shall use the forest roads without fearing us. Wat is sent to give a message to Marian, and Robert tells him to say it's from "Robin" - Marian's childhood nickname for him. Robert, Much and young Tom travel to Whelan's Ditch where Robert meets a tall stranger who announces that no one crosses the stream without his leave. I doubt it will surprise anyone to learn that a quarterstaff duel ensues or that the stranger's name is John Little (of Cumberland, in this version). John seems amused that "Much and Little" are now friends, and Much proposes they should call the stranger "Little John". The outlaws ambush a retinue carrying Roger of Doncaster's sister Adele. Adele tells Roger that Robin was handsome and requests "When you catch him, let me have him first." Then, they rescue Wat from the stocks. Robin engages in a gunfight-style archery duel and kills Legros. And finally the outlaw band don foresters' hoods (to help conceal them) and rescue Saxon forester Will Stukely who had been arrested for secretly helping the outlaws. Robert fights Geoffrey of Doncaster, first with swords and then kills him -- once again in an Old West-style duel of bows. Stukely declares he'll take Robert for his captain. Much and Tom agree. And finally, Little John chuckles and adds "And me. Robin .... Robin Hood." It was utterly different from any previous film on the subject ... It was a dramatization based on as much factual material concerning Robin Hood and his time as we could draw together. Robin Hood, so far as we could tell did not live in Sherwood Forest, he lived in caves, up in the mountains. There are elements from the early ballads. It's set in Barnsdale, Yorkshire -- a setting more common to the earlier legend than the later one. However, in sticking firmly to the Yorkshire location, the movie avoids Sherwood, Nottingham and its sheriff which were also elements of the early legend as well as the modern one. In place of the sheriff, two main villains are drawn from A Gest of Robyn Hode -- Roger of Doncaster and the Abbot of St. Mary's. Also a nod to the original Robin Hood legend is that Robert of Locksley is clearly identified as a yeoman. Yes, he has servants and an apparent position of authority in Locksley. Yes, it seems Robert can read his arrest warrant. But like his ballad counterpart, Robert is lower on the social scale than many other film versions of Robin Hood. Douglas Fairbanks's Robin was the Earl of Huntingdon, Errol Flynn was "Sir Robin of Locksley" and Richard Greene in his opening episode is described as a knight back from the crusades, in possession of a large manor. The huts of Locksley look squalid in comparison. However, Hough was not entirely accurate when he said "We shot it as a true drama with none of the heroics that had marked earlier films." There are many moments of the later Robin Hood legend. The film opens with Robert rescuing a fleeing serf from foresters just as in the 1938 Errol Flynn film and so many later versions. 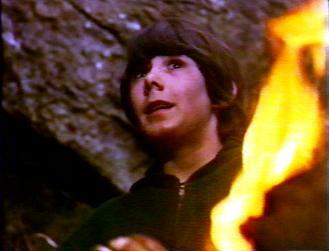 It features the quarterstaff duel with Little John, an element from a later ballad used in most film versions. And one cinematic element that Wolfshead drops is the archery competition, which was part of the early printed ballad A Gest of Robyn Hode. Wolfshead conforms to the modern film tradition rather than the earliest ballads by setting it during King Richard's absence from England. Neither Friar Tuck nor Maid Marian appeared in the earliest ballads, but are in Wolfshead. Marian having an evil suitor is also a hallmark of the 20th and 21st century Robin Hood legend. The tension between Normans and Saxons is a key theme, but it only entered the Robin Hood legend around the time of Sir Walter Scott's 1819 novel Ivanhoe. 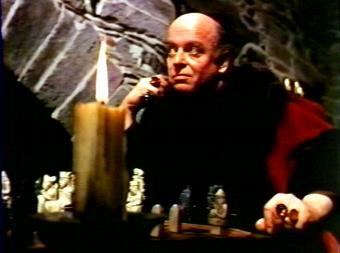 And then, there's the character of Robert of Locksley himself. For all the surface nods to the early Robin Hood legend, the Robin Hood of Wolfshead has little of his ballad predecessor's criminality. While in some films and TV shows, Robin Hood has inherited Wilfred of Ivanhoe's daddy issues, Wolfshead is rare in giving Robin a mother and a sister. At the beginning, Robert is settled with a family of sorts. He's a pillar of the community. The abbot even suggests that Robert pays his taxes. In the initial fight with Geoffrey, Robert points out that he is within his legal rights, a statement the villains privately agree with. This Robin Hood is not inherently rebellious. 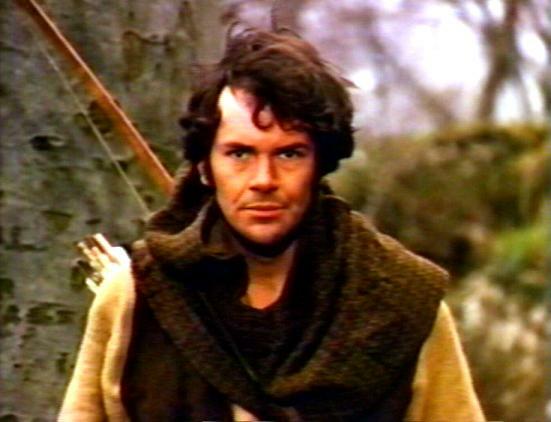 Although Wolfshead plays on the 19th century tropes of making old Saxon England seem like a proto-democracy compared to Norman rule, David Warbeck's Robert in Wolfshead states more emphatically than Errol Flynn's Robin Hood ever did that he does not hate Normans. "This is England. We were born here. We're not Saxons or Normans. We're English. Can't we be together like free human beings?" Almost pathetically given the forces we see aligning against him, Robert tells his mother "I have no enemies." Robert is only spurred to become Robin Hood when it is undeniably clear that he does indeed have enemies. Not only is he falsely convicted by a bad and unjust law using false evidence and testimony. Not only is his outlawry filled in on a blank warrant signed by a usurper prince. But for good measure, Robert's village is attacked, his friends are killed, and his sister is cruelly raped and murdered. Only after all that, does Robert truly rise up against the Normans. The film goes to almost absurd lengths to show Robin Hood as a law-abiding innocent victim. For all the grit and realism of Wolfshead, Robin Hood remains pure -- far more so than even the Errol Flynn Robin Hood. Flynn had a trickster's charm which seems more rebellious than Warbeck's earnestness. The film's Maid Marian - Ciaran Madden - also puts the lie to historical realism. Perhaps it's the cleanliness that comes with her Norman upbringing, but she's the most conspicuously modern looking of the characters. Unfortunately, she doesn't have a great role in Wolfshead. Largely Marian pines and wishes things could be different. She doesn't have the pixy charm of a Joan Rice or the prickly wit of Olivia De Havilland's Marian. Other Merry Men fall into stock roles - Dan Meaden's Little John is big, tough and has a touch of macho humour. Joe Cook's Much, as is common, is dim and child-like. And Patrick O'Dwyer's mute Tom is almost a Tiny Tim figure. However, there is an interesting ambiguity to Kenneth Gilbert's Friar Tuck. 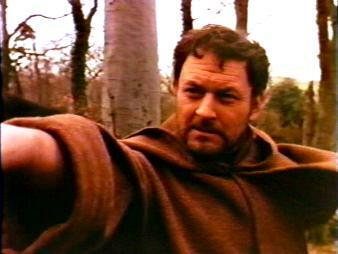 Like Tony Caunter's Tuck in 1975's The Legend of Robin Hood (most notably in an episode also written by the writer of Wolfshead), this Friar Tuck is an odd combination of alcoholic irreverence, a flash of anger and genuine religious faith. And then, there is David Butler (probably the same David Butler who wrote Wolfshead, see below) as Will Stukely - the helpful forester. He has experience that Robin Hood lacks. As Stukely tells Marian, "he's a farmer, my lady. I've covered his tracks as much as I could but sooner or later, they're bound to catch him." If Wolfshead had become a weekly series, perhaps Stukely would have fallen into the mentor role. Margaret Ford in her review in Monthly Film Bulletin called the conflict between the Saxon hero and the Norman conquerors "simplistically presented, as is the apparently wholly wicked church." The most simplistic bad guys Legros and Geoffrey of Doncaster are killed, leaving the two more interesting villains alive if it had been made into a TV series. The Abbot of St. Mary's said "I always told the Doncasters were simple bullies." It was a fair assessment, but Christopher Robbie's Roger of Doncaster displays one of the most interesting aspects of a bully -- insecurity. Despite being a powerful Norman lord, his position is far weaker than he'd like, and Roger is very defensive about matters such as his failure to woo Marian. When his sister Adele remarks that despite his bragging, he hasn't got the people to talk, Roger snaps back "They're not people!" By contrast, Peter Stephens plays the abbot with a serene calm. The abbot is diffident and smug like some Tory politicians. He's amused by events that will not affect him. While Stephens is the most enjoyable villain, they all lack the spark of an Alan Rickman or Claude Rains to truly energize the film. If Wolfshead had become a weekly series, perhaps appearances by Prince John would have been livened things up as Roger was angling to join John's conspiracy. Wolfshead does suffer from its pilot status, as much of the film is about setting up the status quo for a show that never happened. Although Roger of Doncaster is a suitor for Marian, the two characters never share a scene together. And then, while Tom's mother was taken by the Doncasters, it's never made clear if she died. There s clearly material for future stories. It's hard to imagine the lovely production values of this film being repeated on a weekly schedule. This is a superbly composed film -- although a little too composed for the British Film Monthly review which complained that "fetching camera angles are dwelt on a little too closely". In discussing Wolfshead with a friend, I wondered if the aftermath of the attack on Locksley was a reference to the situation in Vietnam. "Maybe," she replied. "But mostly it sounds like The Searchers." Looking at John Ford's much-homaged western, I could see the similarities. Despite being a film about an English folk hero with a British cast and crew, there is more than a touch of the Western to Wolfshead. Not just the aftermath of Doncaster's cruelty and the funeral scene, but the landscape itself is a character in the film. The mountains of North Wales stand in place of Monument Valley's stark beauty. Even the close-range archery shoot-outs Robin has with Legros and Geoffrey are staged almost like gunfights. With every new Robin Hood film or TV series, PR hacks point out that "this time, Robin Hood isn't wearing tights." The image of Errol Flynn in his tights and rhinestones lingers in the public imagination, but Robin didn't wear tights in either 1991 film, or the 1980s Robin of Sherwood TV series (well, okay, Praed's leggings were tight-fitting) or 1976's Robin and Marian or the 1975 BBC TV mini-series The Legend of Robin Hood. Wolfshead is among the first films to dispose of Robin's tights. Its attempt to shy away from swashbuckling glitz was followed by later productions. But Wolfshead had a more direct influence on two versions of Robin Hood in particular. 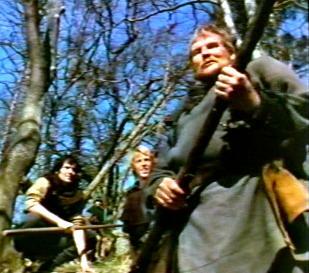 David Butler is also credited with writing episode four of the BBC's 1975 The Legend of Robin Hood TV series. Butler's episode borrows heavily from A Gest of Robyn Hode by featuring the story of Sir Richard's debt to the smug and proud abbot of St. Mary's. His episode also includes darker elements with the outlaws engaging in roadside robberies and concluding with the death of Will Scarlet. Also, in an interview in Starlog magazine (#151), Robin of Sherwood creator -- and friend to David Butler -- Richard Carpenter revealed that if Wolfshead had become a weekly series, Carpenter would have been one of the writers. Speaking on Wolfshead, Carpenter said "What it did was to have a very realistic look at being an outlaw in the 13th century and I wanted to have that element as well as the occult and humour." And it is the lack of humour in Wolfshead that marks it more as a noble failure than as a roaring success. I agree with Margaret Ford's analysis that "All in all, the film takes itself a bit too seriously: the solid and sincere Robin has no spark of humour, none of the joie de vivre one associates with the character." In trying to correct the overly light versions of Robin Hood, Wolfshead is too dark. It doesn't feel as much adult as it does adolescent - a teenager sulking with a desire to earn his place at the grown-up table and yet proving that he's not quite grown-up yet. Then again, without that stage of adolescence, would one ever achieve adulthood? Even if it is too serious, even if it did not succeed at the box office, there is still much to be admired in Wolfshead. And it is a shame that a film which helped shape the modern Robin Hood legend is not better known. There seems to be some confusion on online sources as to which David Butler wrote Wolfshead, when this article was written in February and March 2010, the Internet Movie DataBase credited the movie to an American writer and director named David Butler (his first writing credit in 30 years). And yet, in his Starlog interview, Richard Carpenter credits it to the same David Butler who co-wrote Jesus of Nazareth, a British actor-turned-writer more appropriate for the period (and also the one credited with writing an episode of The Legend of Robin Hood. Looking at photos from his acting career, this David Butler looks like the David Butler who played Will Stukely in Wolfshead, And yet, IMDB appears to have credited a separate entry for some of that David Butler's acting gigs. I stumbled across this David Butler confusion in the same month I found some library catalogues had conflated Henry Gilbert, British children's author, and Henry F.B. Gilbert, American composer. I feel in this name-confusion, there's probably a lesson to be learned by those searching for a "real" Robin Hood. Text copyright, © Allen W. Wright, 2010. Images from Wolfshead are © copyright Hammer Productions, 1969 and are used without permission, under fair use for the purpose of criticism and review.